George Beatson Blair bequest, 1941. Loosely painted scene from Romeo and Juliet, depicting a moment from Act V, Scene 4 in which the lovers are found dead in the Capulet tomb. The various figure groups are arranged as a tableau, with Romeo and Juliet in the centre of the composition; the body of Romeo, dressed in a yellow tunic, is partially covered by that of Juliet, in a white gown. 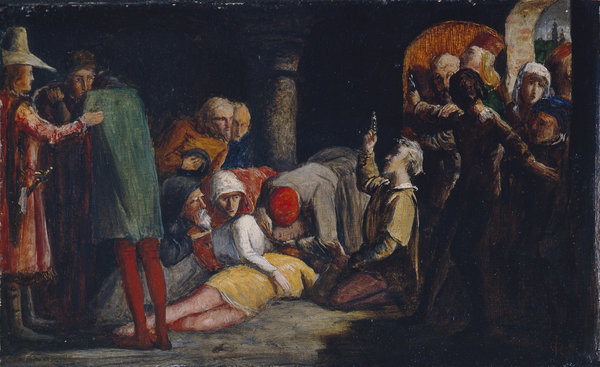 Five figures gather around the bodies as one of them places their hands at Juliet's throat, as if in search of a pulse; a sixth figure, kneeling to the right of the bodies, holds up a phial of poison. To the left is a group of three grieving family members. To the right, a group of figures crowd at an open door, which reveals a nighttime cityscape beyond. The entire scene is illuminated only by the open door and light cast from the outside. The Death of Romeo and Juliet about 1848 John Everett Millais 1829-1896 Oil on millboard Shakespeare's Romeo and Juliet was a popular choice for artists in the nineteenth century. Many depicted their romantic courtship rather than the horrifying and poignant moment shown in this small study, when the bodies of the dead lovers are discovered.